Published: Dec. 18, 2012 at 10:50 p.m. Updated: Dec. 19, 2012 at 03:21 p.m. It doesn't take much courage to "stick a fork" in a team that's already been mathematically eliminated from postseason contention. Feel free to take this up with our boss, Gregg Rosenthal (that's @greggrosenthal), who gave the New York Jets several Fork pardons despite the repeated objections of his underlings. But there's no escaping it now. The Jets are done. And here's why. Now that's a loaded question. Let's start with Mark Sanchez, who suffered through a miserable season before mercifully being benched on Tuesday. Poor mechanics, ill-advised decision-making, and an inability to protect the football made him perhaps the NFL's worst starting quarterback in the non-Whisenhunt division. The Jets needed Sanchez to take a step forward if they had any chance to contend. Instead, he took two steps back. The Tim Tebow experiment was a disaster from the start. The Jets never found a way to effectively use him and his presence helped create a circus atmosphere that undermined the operation. It also became increasingly clear as the season moved on that Rex Ryan simply didn't believe in Tebow as a legitimate option to Sanchez. Think about it: Greg McElroy is starting next Sunday. Even Tebow must be muttering expletives to himself. Well, probably not. Then there were the injuries. Darrelle Revis was lost back in Week 3, a blown ACL that eliminated the only undisputed edge the Jets took into every game. Santonio Holmes soon followed Revis to injured reserve with a Lisfranc tear. Dustin Keller, Sanchez's longtime security blanket, disappeared for most of the year with leg and ankle injuries. According to ESPN, general manager Mike Tannenbaum said the team plans to conduct a study to try to understand how the team lost so many players this season. Good luck with that. Hmmmm, what else? Mike Westhoff's special-teams unit was a mistake-filled mess. Quinton Coples and Stephen Hill -- the team's top two draft picks -- underwhelmed. Fireman Ed quit. The list goes on and on. Losing Revis was a devastating blow, but the defense held its own without him. Antonio Cromartie has been particularly good, and deserves to go the Pro Bowl next month. LaRon Landry managed to stay healthy and brought stability to the safety position. Mohammed Wilkerson showed growth on the D-line and serves as a much-needed draft hit for Mike Tannenbaum. Led by Nick Mangold and a healthy offensive line, the running game found its groove in the second half, with Bilal Powell looking particularly good in recent weeks. Wide receiver Jeremy Kerley showed promise. 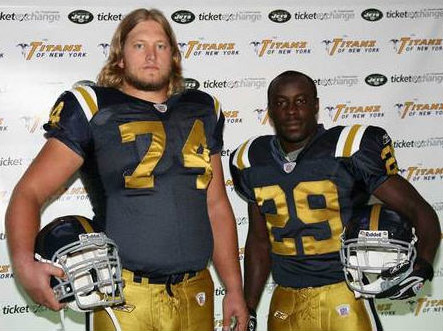 The Jets also passed on wearing those ugly blue throwbacks this season. So that was good. Ryan is a big pride guy, and you know he doesn't want to finish in last place in the AFC East. The Jets are tied with the Miami Dolphins at 6-8 and have a one-game lead on the Buffalo Bills. The Jets close our their season at Orchard Park on Dec. 30. We suppose getting to .500 would bring a modicum of solace, even if it was at the cost of a better first-round pick. We doubt McElroy is viewed as the quarterback of the future, but it's smart to give him a two-game audition. Maybe he's a future No. 2. Ryan would be wise to remind his players to bite their tongues during locker clean-out time when media figures come searching for those dastardly anonymous quotes. Team owner Woody Johnson isn't an easy man to read, but we wouldn't be surprised if Tannenbaum is let go as GM. Poor roster depth, the Tebow trade, and that needless Sanchez contract extension form a potent cocktail of doom for Mr. T.
We'd guess Ryan will be back, but patience will be short. This has been an embarrassing season for the franchise, and Ryan -- easily the team's most recognizable figure -- has plenty of egg on his face. Ryan earned rope with his back-to-back AFC title appearances. That's just about all gone. And then there's Sanchez. Too much has transpired this year to envision him leading this team again. A clean break is best for all involved, but that guaranteed salary in 2013 keeps him tethered to a team that no longer believes in him. J-E-T-S, mess, mess, mess.